Jenison Brito's hat trick and Miguel Herlein's brace pace the reserve side to its biggest win of the year. HEMPSTEAD, N.Y. (July 5, 2015) – New York Cosmos B sealed the NPSL North Atlantic Conference title in emphatic fashion, scoring nine goals without reply against Rhode Island Reds on Saturday. Brazilian forward Jenison Brito hit a hat trick in his first start for the team, and substitute Miguel Herlein got two of the goals. It was 4-0 at the interval, then a flurry of five goals in the last 15 minutes made the scoreline even more impressive. Head coach Alecko Eskandarian reflected on his unbeaten side's seventh straight win. “To be honest I was a little bit disappointed with our play in the first half," he said after the game. "Things needed to be quicker and sharper. We made some adjustments at halftime and credit to our guys, they played a much stronger second half and I think they got rewarded for their hard work. The Cosmos dominated from the beginning, but took until the 21st minute to break the deadlock. Before that Brito headed one over, played in Haji Wright whose earlier shot went well over the top. Ibrahim Diaby missed a glorious chance in the 19th minute, firing over when unmarked in front of goal from a free kick. When the goal arrived it was from a Christhian Hernandez through ball that Brito dispatched under Rhode Island goalkeeper Jonathan Anderson. Wright finished confidently from Nick Costa's cross in the 27th minute. A Hernandez free kick was just off target, then Wright went on a dangerous run down the left but his pullback was scrambled away. Rhode Island did nothing to help their cause when Joshua Butler turned in a Hernandez corner for an own goal on 39 minutes. Another corner from Hernandez led to the fourth goal two minutes later, though this time it was converted by a Cosmos player, John Neeskens, with a header. The Reds managed a couple of efforts on goal just before the break. Richard Aprile's free kick was saved by Brian Holt, then Brajan Huyke got behind the defense but blazed over. Diaby flashed a shot over and Herlein almost produced a spectacular goal from distance early in the second half, but it just missed the top corner. Anderson saved from Herlein then Brian Cunningham put the loose ball over in the 58th minute, and Neeskens won the ball in midfield and strode forward only to shoot straight at the goalkeeper. The goals really began to flow from the 75th minute, when former Portugal youth international Herlein posted a contender for goal of the match with a free kick curled into the top corner from 20 yards. A minute later it was 6-0, Pittman making the most of a failed clearance to blast in. Brito turned in Neeskens' cross at the back post a minute after that, as the visitors wondered what had hit them. Rhode Island had their best chance of the match in the 78th minute, Huyke once again getting in on goal. Holt saved well and Huyke's second attempt was blocked. Two minutes from time, Herlein was quickest to react to a goalmouth scramble and forced the ball over the line. Then Brito completed his hat trick and the scoring with a low finish from Gonzalo Rodriguez's low right-wing cross in the last minute. 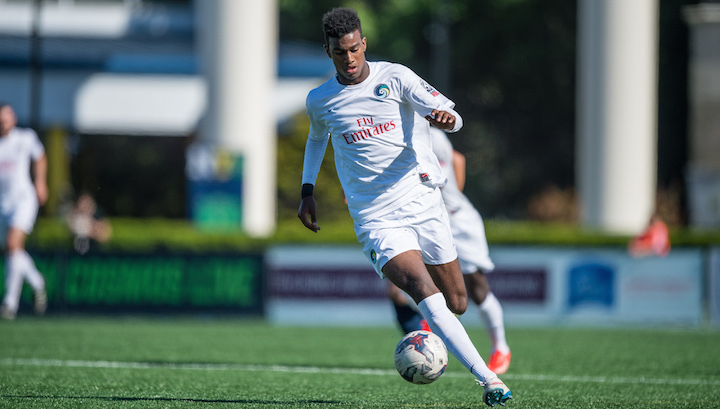 Cosmos B complete their regular season with two home games next weekend. They entertain Seacoast United Phantoms at Mitchel Field on Saturday, July 11 at 11 a.m. ET, then Greater Lowell United at Hofstra Soccer Stadium on Sunday, July 12 at 11 a.m. ET. Six teams advance to the playoffs from the NPSL's Northeast Region, with the top two sides receiving byes in the opening round of postseason competition. 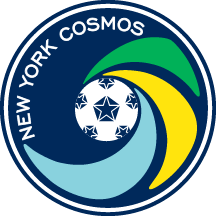 Cosmos B can secure a bye next weekend. The first round kicks off July 18.